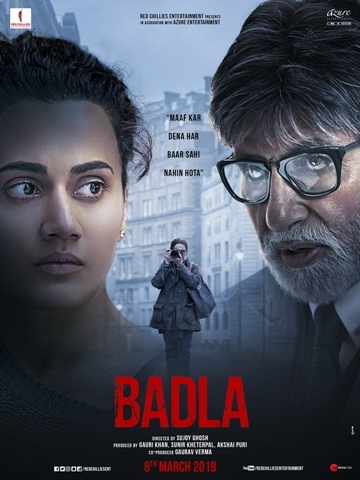 ‘Badla’ opens differently for an extremely convoluted murder mystery in a rather sober manner; a tad lethargically. The lengthy conversations between an ace lawyer and a murder accused form the entire movie with flashbacks during narration. Naina Sethi (ruthless, shrewd but at times vulnerable corporate head) needs the help of a clever criminal lawyer Badal Gupta (Amitabh Bhachchan) who could bail her out from the gallows. The smart lawyer wants from Naina ‘The truth and nothing but the truth’ so that he can save her life. ( A client needs to be true to the doctor and lawyer, isn’t it?). The accident and the death of a young guy leads Naina and her paramour Arjun (Tony Luke) in the outskirts of London in an idyllic forest become the cause of a blackmail in which Arjun turns a victim and gets killed in a luxurious hotel room where he and Naina stay with large sums of money to be delivered to the blackmailer. Police arrests Naina with bleeding wound with injury by the side of Arjun. Naina has to reveal the reasons behind the blackmail, ransom and another dead body. The lawyer cross examines Naina and when she opens up gradually there are several loose ends without connectivity. There is this vengeance seeking Rani, mother of the young who was killed in the accident seems to be the mastermind behind Naina’s arrest. There are more truths to come across stage by stage through the endless arguments between Naina and Badal. At one stage, the viewer definitely reaches the point of ennui because of the countless hypotheses proposed or concocted by the accused and the lawyer. Yes. The grand finale comes at a point. The sagging audience gets a jolt in the last fifteen minutes. I don’t want to be a spoiler for those who want to see the movie. Said to be based on a Spanish movie, director Sujoy Ghosh had done a good job though not as good as his earlier outing ‘Kahani’. Taapsee Pannu and Amitabh Bachchan simply vie with each other for acting honors figuratively and in the real sense. Tall, dark, lithe Tony Luke as Arjun, and Manav Kaul as Naina’s lawyer make their presence felt. Amrita Singh, as a vivacious and garrulous mother of the deceased is quite impressive. Well, one needs a little more patience to watch this just two hour whodunit murder mystery because most of the time the movie is verbose than action.